I hope you all had a great Christmas! I've been extremely busy these last few days. Aki's sister got married on the 23rd (need to post the look I wore that day, along with photo's of the wedding). On the 24th, we spent the day sightseeing with his family members that came down from Akita for the wedding. In the evening, we attended a friends Christmas Eve party (thence this post), and on Christmas day we had another party to attend (that look with me posted next). I had to work on the 26th, so I hope you can understand why these posts are coming to you late. 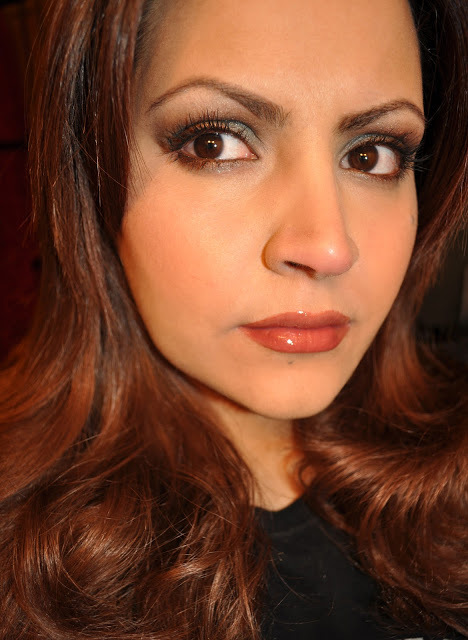 I decided to use Chantecaille's Safari Collection to create my Christmas Eve look. From left to right: The Elephant Palette Ivory, Grassland, Iron Ore, Red Earth. From left to right: Elephant Cheek Shade Fun, Bronze Gel Liner Pencil, Isis Lip Chic, Fig Luminous Gloss. Chantecaille Elephant Cheek Shade in Fun. Chantecaille The Elephant Palette shade in Ivory (used to highlight the cheekbone). Ivory (placed on the brow bone and inner corner). Grassland (on the lid and lower lashline). Red Earth (blended into the crease and lightly blended inner half of the lower lashline under Grassland). Chantecaille Gel Liner Pencil in Bronze (used on the upper and lower waterline, the upper lashline, and the outer half of the lower lashline). Chantecaille Lip Chic in Isis. Chantecaille Luminous Gloss in Fig. I love Elephants (something I get from my mom), so it was a no-brainer that I'd purchase every piece in this collection. I've fallen in love with this entire collection, especially the palette and both lip products. I was disappointed in the fun cheek palette. The fact that it arrived with a dent in the lid didn't help matters much either. I wish Chantecaille would invest a bit more in their packaging! Both, the cupcake highlighter and the HD powder compact arrived with dents too & shipping them back to the States for an exchange is just too much hastle. The Nocturne Lip chic and Glamour gloss from the Holiday collection also are divine btw! Hope you had a great dinner party! Absolutely lovely! I am so impressed by how pigmented that Chante gloss is...most of the ones I own (e.g., Charm, Lucky) are quite sheer. I love the formula in general however...not sticky and very hydrating!! Agreed Buggsiebee, I was also disappointed with the blush. Don't get me wrong, I do like it, I was just expecting something else. What the heck are they doing to your packages during transit?!?!? I own a few other palettes from Chantecaille, but it's not a brand I usually got crazy for. The dinner was good, but sadly we didn't exchange presents...BOO! I really loved the eyeshadow palette and both lip products. All three products are wonderfully pigmented. The eyeshadows are lux and both lip products feel divine! Hope you had a wonderful Holiday as well, what did you do? A blogger friend of mine said that she has previously recieved used ( obviously swatched ) items from Nordies & Saks so I guess they send us their leftovers. OMG, and the way it's packed is shameful!! Neimans, Saks, and Nordstrom especially are pretty bad at sending a huge box containing one items; sometimes samples. I have packages sent to my best friend and he opens the boxes while we're skyping. I own of few of the palette,and I have to say the shadows are lovely, but I don't used them that much either. One thing I will say, I wish they'd offer 10% instead of 5% to go to the animal organizations. I got this elephant palette too! It's my first Chantecaille purchase and I got their gel foundation as well... absolutely love it! I love the palette but the rusty brown shade a little tricky on me, as it's a tad too warm... gotta find a way to get around it! hope to see more of your posts... and preview for the upcoming spring collection! I am eyeing on SUQQU and ADDICTION launches!!! it's looks a bit orangey on me... or too warm? But I will find a way to make it work, as you say, blending with other colors! I am eyeing on the Laduree minis that will be coming out soon as a limited edition... but my usualy CPer will not be able to help this time around. I am working overtime these days (interestingly enough on jobs related to Sephora...) so I can spend more on up coming spring collections! Red Earth also works beautifully as a blush. The lipstick and gloss are amazing. I do not own any Chantecaille makeup currently, it is time for another look. Both lip products are AMAZING!! Yeah, I only have a few palettes from Chantecaille. You look stunning and I love that you went with something outside the "traditional" holiday makeup looks. It's rich and warm and suits you very well. Thank you for the lovely compliment Kate! Do you have a blog? If so, please let me know, I'd love to subscribe. Why thank you! It's morelikespace.blogspot.com. Happy New Year! Having special meals, become ordained online decorating houses with Christmas trees, sending greetings cards, giving gifts and participating in prayers are all parts of the celebrations.